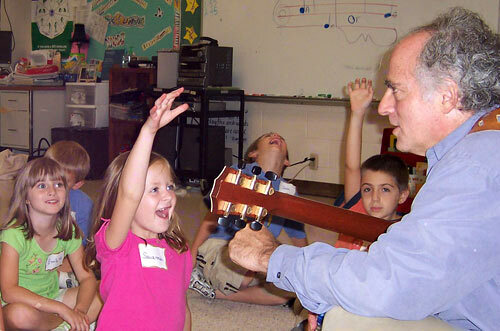 Songs from the Classroom to 'Kid Pan Alley' For some musicians good song writing is elementary. For others it's elementary school. A CD called Kid Pan Alley collects tunes created in classrooms around the country and recorded by top Nashville artists, including Amy Grant. 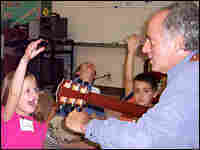 Paul Reisler conducts a songwriting workshop at Nolensville Elementary School, near Nashville, Tenn.
Paul Reisler tells Renee Montagne how the songwriting project exposes children to a variety of musical styles. For some musicians, good songwriting is elementary. For others it's elementary school. A CD called Kid Pan Alley collects tunes created in classrooms around the country and recorded by some pretty famous Nashville artists, including Amy Grant and Delbert McClinton. 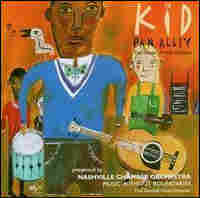 Kid Pan Alley was produced by the Nashville Chamber Orchestra and singer/songwriter Paul Reisler. He's best known as a founding member of the folk group Trapezoid. For nearly seven years, Reisler has criss-crossed America conducting songwriting workshops for kids from 6 to 10 years old. "The great thing about writing with kids is, it's not edited before it comes out of their mouth," Reisler tells Renee Montagne. In a song called "The Rainforest," a second-grade class at Nashville's Paragon Mills Elementary had been studying rainforests. Reisler asked the students what they wanted to write about. "So we started talking about weird things you could see in the rainforest. And when I can feel that I can see a direction that the song's going in, when I feel like we have a lot of great ideas and things to work with, we just start writing lyrics." Age seems to be no limit to great songwriting, Reisler says. He worked in a playschool so he could see how young he could go with the program. "I had kids as young as 3 years old and they were thinking in metaphor," he says. "They would say things like, 'The wind brought me pony.'" But the younger crowd can often be better songwriters than teens, he says. "In general, when I've worked with high school kids, the songs are not as good as the elementary kids because they're thinking linearly and logically as opposed to in image and metaphor."